I was going to a pot luck Oscar party and knew I needed to prep for a big hungry group. It was chilly outside and I was suddenly craving mac and cheese, but then again, I felt guilty about all that cheese and cream and otherwise artery-clogging goodness. Then I found this recipe on epicurious.com with Swiss chard, lowfat milk and Gouda and Edam, the king and queen of Dutch cheese. The Dutch are so tall and fit, their cheese can't be all bad for you, can it? You can check out the recipe below for exact details on its nutritional merits. But first, how does it taste? Since I was bringing it to a pot luck, I par baked it for 30 minutes (instead of the required 40), wrapped it in foil and cruised across town to the party. The hot cheese smell in the car was a bit overwhelming, to the point where I thought I might be serving a limburger pie. Crossing my fingers that wasn't the case, I finished off the casserole in the host's oven for 12 minutes and blasted it under the broiler for an additional 5 to brown and crisp the top crust. I added another five minutes to cool it off and the moment of truth was upon us - was this a hot stinky mess? The finished product was actually the most mild mac and cheese I've ever tasted! Creamy, crunchy with a delicious note of green earthiness from the chard, you can pretend this is a healthy mac all you want, but the three helpings you'll eat are decidedly not! Here is the recipe, reprinted from epicurious.com, with my modifications included. Happy mac'n! Preheat oven to 350°F. Butter 13x9x2 inch baking dish. Cook chard in large pot of boiling salted water until tender, about 1 minute. Using slotted spoon, transfer chard to plate; cool. Reserve pot with water. Squeeze water from chard; chop finely. Return water in pot to boil. Add macaroni; cook until tender but still firm to bite, stirring occasionally. Drain. Stir macaroni into warm cheese sauce. Place half of macaroni in dish; smooth top. Top with 1 cup Edam cheese, then chard. (I did not layer with the Edam; rather I included it in the cheese sauce) Top with remaining macaroni mixture; spread evenly. Melt 3 tablespoons butter. Place breadcrumbs in medium bowl. Drizzle butter over; toss. Add 1/2 cup finely grated Gouda (I used Parmesan cheese instead) and sprinkle with salt and pepper; toss. Sprinkle breadcrumb mixture over mac and cheese. Sprinkle cumin seeds over, if desired. 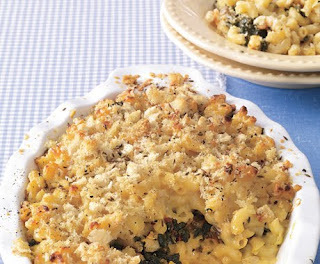 Bake mac and cheese until breadcrumbs are golden and edges are bubbling, about 40 minutes. Let stand 10 minutes. Devour at once!